Discussions of the application of digital to democracy tend to get bogged down quite quickly in the (limited) merits and (extensive) risks of online voting. A more promising approach is to look at ways in which digital technologies can support and amplify democratic processes, more to do with deliberation and engagement than with quantification. This is still new territory, so experimental approaches still make good sense, but as this post brings out, there are now enough of those experiments around the world to start to group them and to see common opportunities and challenges. This is the recording of an event at the Institute for Government this week, in which Jamie Susskind starts by briefly introducing the arguments of his book, Future Politics, and then discusses them with Gavin Freeguard – and as the book weighs in at over 500 pages, this might be a gentler way in. Susskind approaches the question of the title from the perspective of politics and law, coming back to the question, how much democracy is the right amount? That’s a harder – and more important – question than it first appears. Answers to it have been evolving for several thousand years, but digital technology gives it a new urgency, for reasons which range from the manipulative power of social media, the elimination of leeway, to bot-driven perpetual voting. In the last century the fundamental question was, what should be done by the state and what should be left to the market and to civil society? … In our time, the key question will be this, to what extent should our lives be governed by powerful digital systems, and on what terms? The really interesting effects of technology are often the second and third order ones. The invention of electricity changed the design of factories. The invention of the internal combustion engine changed the design of cities. The invention of social media shows signs of changing the design of democracy. This essay is a broader and bolder exploration of the consequences of today’s new technologies. That AI will destroy jobs is a common argument, that it might destroy human judgement and ability to make decisions is a rather bolder one (apparently a really creative human chess move is now seen as an indicator of potential cheating, since creativity in chess is now overwhelmingly the province of computers). The most intriguing argument is that new technologies destroy the comparative advantage of democracy over dictatorship. The important difference between the two, it asserts, is not between their ethics but between their data processing models. Centralised data and decision making used to be a weakness; increasingly it is a strength. There is much to debate in all that, of course. But the underlying point, that those later order effects are important to recognise, understand and address, is powerfully made. This is a great set of slides which (among other things) teases out the idea of ‘needs’ in relation to public services, clearly and powerfully making the point that it is not enough just to consider the needs of individual end users. The picture is in the presentation, but came originally from a post by Cassie Robinson a few months ago. The GDS admonition to start with user needs is not wrong (quite the contrary), but there will rarely, if ever, be a single set of answers. And as Tom Loosemore observed, prompted by that illustration and quoting Richard Pope, ‘sometimes the user need is democracy’. But there is more to the presentation than just that insight, important though it is. 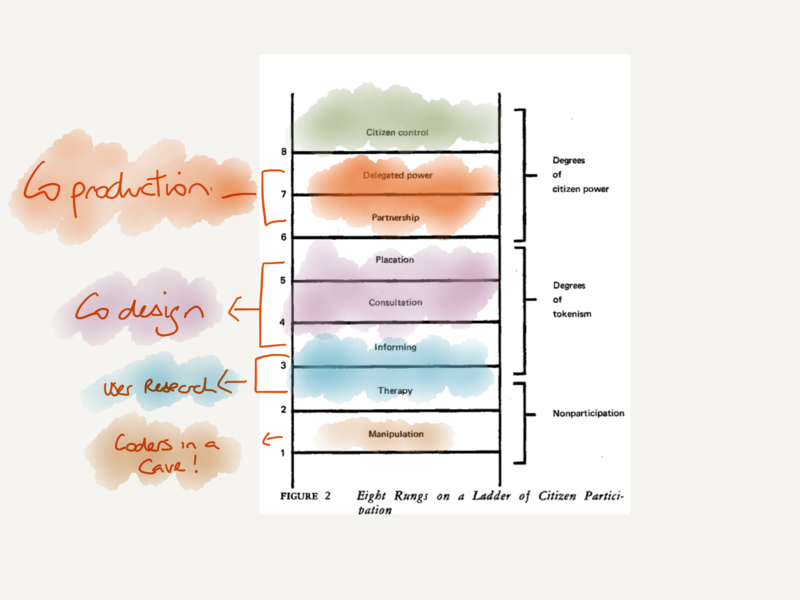 Ease of use is not the same as depth of understanding, and the simplicity of a service design does not mean that it is simple or self-contained in the way people come to it and use it. Needs are important, but so are interests – which means that service design has to embrace much more than the transactional experience. The modern surge of digital government has many strengths, but it also has a central weakness. It tends to assume (usually without noticing that it has done so) that the central relationship between individual and state is that between a service user and a service provider. That relationship does, of course, exist and making it work better is vitally important. But if that’s all there is to it, we risk creating something more atomised and more shallow than it could be or should be. There are two missing pieces from that service led view. One is that the role of a government service user goes beyond the specific interaction or transaction of the moment. The other is that there are legitimate interests in the service and how it is provided which goes well beyond those who are specific users of it. Systems have democratic and social value, as well as transactional value, and to miss that is to miss something important. This post explores the implications of that in one specific way, as well as more generally. Building on the idea of technical and organisational debt, now democratic debt comes into the mix as well. The slightly unexpected specific point which comes from that is the importance of thinking about user research differently, and recognising that cumulatively it represents a corpus of social research which beyond its immediate use is almost invariably unpublished, unseen and thus unusable. The challenge is to find a way of curating and using that research and the insights it has generated to drive down democratic debt. At one level, this is an entertainingly polite but damning book review. At another, it is a case study in how profound expertise in one academic domain does not automatically translate into the distillation of wisdom in another. But beyond both of those, the real value of this piece is in drawing out the point that in the realm of ideas, as with so many others, the internet is a place where new things are happening, not just the old things being done a bit better. We need to get better not just at knowing things, but at how to know things. How, in this new world, do we take advantage of its strengths to come at knowledge in different ways? I had got to the end of reading this before noticing that it was by David Weinberger. That would have been endorsement enough – he has been sharing deep insights about how all this works for many years and is always a name to look out for. That has implications well beyond politics and persuasion and supports the wider conclusion that algorithmic decision making needs to be understood, not just assumed to be neutral. This TED talk is a little slow to get going, but increasingly catches fire. The power of algorithmically driven media may start with the crude presentation of adverts for the thing we have already just bought, but the same powers of tracking and micro-segmentation create the potential for social and political manipulation. Advertising-based social media platforms are based on persuasion architectures, and those architectures make no distinction between persuasion to buy and persuasion to vote. That analysis leads – among other things – to a very different perception of the central risk of artificial intelligence: it is not that technology will develop a will of its own, but that it will embody, almost undetectably, the will of those in a position to use it. The technology itself may, in some senses, be neutral; the business models it supports may well not be. This wide ranging and fast moving report hits the Strategic Reading jackpot. It provides a bravura tour of more of the topics covered here than is plausible in a single document, ticking almost every category box along the way. It moves at considerable speed, but without sacrificing coherence or clarity. That sets the context for a set of radical recommendations to government, based on the premise established at the outset that incremental change is a route to mediocrity, that ‘status quo plus’ is a grave mistake. Not many people could pull that off with such aplomb. The pace and fluency sweep the reader along through the recommendations, which range from the almost obvious to the distinctly unexpected. There is a debate to be had about whether they are the best (or the right) ways forward, but it’s a debate well worth having, for which this is an excellent provocation. Democracy, as Winston Churchill famously observed, is the worst form of government except for all the others. So far, so good: few find it tactful to disagree. But the practical application of that ranges from infrequent voting to intense participatory involvement. There is, this post argues, an increasing tendency for real decisions to made by experts (or, at least, professional politicians), with citizens reduced to the role of an approving chorus. The claim implicitly made by those experts that they are just better at this is somewhat questionable; a better remedy is to devolve decision making to the lowest possible level. In a way the post doesn’t quite seem to recognise, this moves the problem around, rather than solving it. That’s partly because everybody is in favour of devolved decision making (subsidiarity is after all a fundamental principle of EU decision making), but almost everybody sees the level they happen to be at as the most appropriate one. But even more importantly it’s because it fails to distinguish between different kinds of decisions. Politics is only surprisingly rarely about making self-contained decisions, straightforward choices between clear options. What makes politics – and democracy – hard is the interaction between decisions, the fact that every decision is constrained by and constrains every other one, that decisions are relative rather than absolute. On that, Catherine Howe’s approach, recently featured here, is a stronger one: the question is how to design for democracy, in the full recognition that decisions are political; it is not best answered by assuming that being local is itself adequate. This is a powerful challenge to everybody who works in any part of government. The system is fundamentally broken because its components were never designed or intended to act coherently and effectively as a system – and they don’t. There is considerable power in that diagnosis, implying if not quite drawing the conclusion that if you want to change the system, you have to change the system. The problem, of course, is that that is both intrinsically very hard to do and never seems to be as important or urgent as addressing specific policy problems – which is where we came in. So the hard question is not whether a better system could be devised (because there can be little doubt that it could be); it is whether the current system has the capability to make the changes needed. It is hard to stop and start again from scratch. That’s not just true of the UK – it has been argued that the most needed amendment to the US constitution is to make it easier to make constitutional amendments, which is probably impossible. None of that makes Straw’s diagnosis wrong, but it does underline that the route to change is as critical as the destination. What government organisations get is hierarchy, slow and often unresponsive decision cycles and a sense that government is done to people, rather than with them, still less by them. There are – or were – some very real strengths in a Weberian rationalist bureaucracy, but Weber was writing a century ago for a very different world. Adaptation is as crucial for organisational evolution as it is for natural evolution – without it, organisations become less and less well fitted to their environment and eventually fail. But that failure can be long drawn out and painful to all concerned. This essay is about spotting – and encouraging – new approaches to public administration, better suited to new requirements and new contexts. 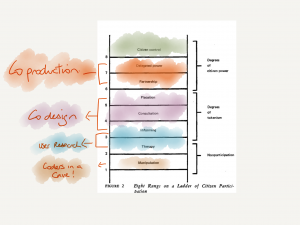 One of the misunderstanding which often crops up between people who approach problems from a digital service design perspective and those who come more from a traditional policy development perspective is around transactional services – whether fundamentally we are designing services for users or outcomes for society. This post comes from a very different perspective of deliberative policy development, drawing out very clearly that people see their role as citizen more broadly than their role as consumer, even when they are being both simultaneously. Good policy comes from good policy making. 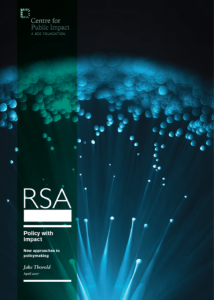 There is plenty of evidence that good policy making is based not just on the rigorous analysis and evidence assessment which is the best of the traditional approach, but also on effective implementation and deep understanding of the needs and behaviour of those who will be affected by the policy. This post argues for a more broadly based approach to policy making, drawing on The Blunders of Our Governments (which remains compelling reading) to make the case. The problem with this is not – as the author supposes – that it sounds fanciful – it is that it sounds obvious. The problem is not in recognising that policy were better done differently, it is in the doing of it. The post introduces a more substantial paper which has some useful material, but ends up describing barriers to change without offering much about how to overcome them. Social media have been playing a part in election campaigns for quite a while now, but this year’s general election may mark a tipping point where for an important part of the electorate traditional media are essentially irrelevant. There’s some proper academic caution in this post – it really is too early to tell – but – but if the trend is confirmed, the implications go very much wider than election campaigns. Social media first played a significant role in electoral politics during the US presidential election in 2000. 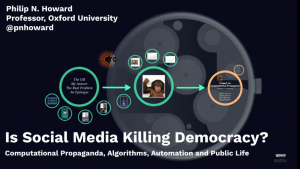 The first part of this inaugural lecture traces its development since then, through the Arab Spring, to more recent US and European elections, with some interesting insights into ‘computational propaganda’, the role of bots in moving and reinforcing public opinion, and the fake (or junk) news which is often its subject. The second part of the lecture turns to the rapidly developing connections between big data, behaviour, and the internet of things. It is increasingly possible to derive political inferences from behaviour, such as purchasing patterns, as well as from overt speech – in the internet we have, privacy has essentially been lost. That could be countered, at least in part, by measures to improve the power balance between large organisations and civic society, but there is little current prospect of those proposed getting any traction.